The Australian Institute of Asian Culture and Visual Arts (VisAsia) of the Art Gallery of New South Wales (AGNSW) was established in 1999 to promote the appreciation in Australia of Asian visual arts and culture through exhibitions, events and education. 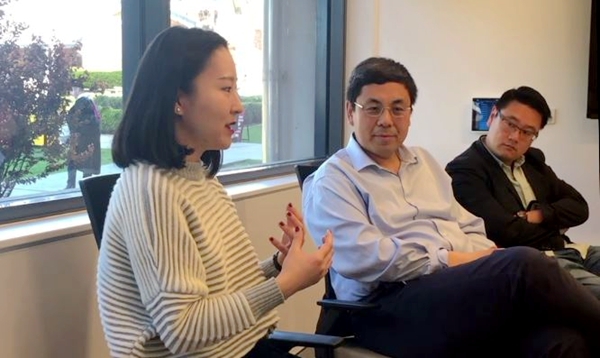 On 27 September, 2018, Ms Yuan Liu, who joined VisAsia as a Coordinator a year ago came to the Institute to speak to our Master of Chinese Cultural Relations students about her experience of working in this distinguished cultural organization in Sydney. Ms Liu assured ACIAC students that there were a lot of really good cultural organizations worth knowing about and encouraged students to reach out to find out about them. She briefly recalled her time as a student at Sydney University with an interest in art and how this passion for art attracted her toward the arts organizations. She then introduced AGNSW and VisAsia and some of their latest developments, current exhibitions and events. She invited ACIAC students to see the exhibitions and attend some of the events. In answer to questions from our students, Ms Liu spoke more about a current exhibition of Asian artworks that bear images of women’s misery, the cosmopolitan features of contemporary Chinese art and her earlier experiences of working her way towards her current job. The students spoke about their tentative ideas for their research projects. Ms Liu offered very positive comments. Professor Labao Wang, Dr Xiang Ren, Dr Kiu-wai Chu and Ms Lindsay Liu also attended the meeting.